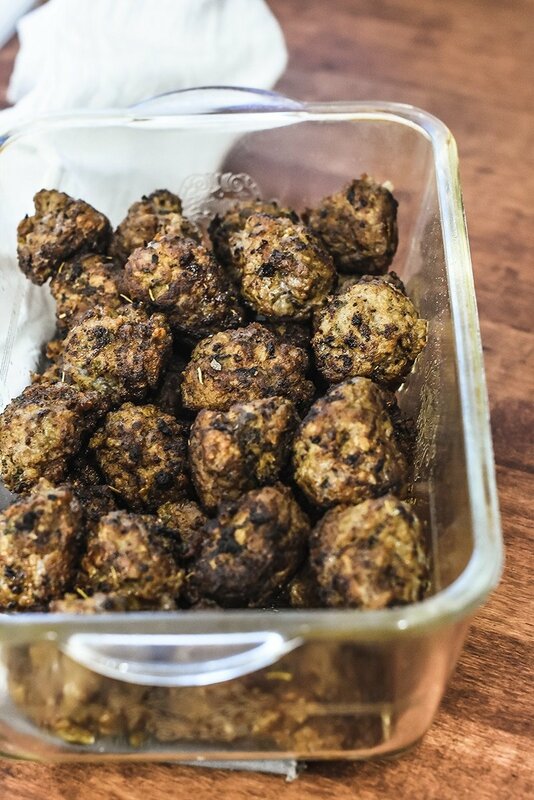 From my Minnesota kitchen, this authentic Swedish Meatballs recipe is easy to make and BETTER than the IKEA version. A traditional family favorite! This uses oats instead of bread making it gluten-free…score! Note: this is the authentic 1/2 ground lamb and 1/2 ground beef recipe, most often my family prefers all ground beef which works great! And that, my dear friends, sums up the whole spice profile of Swedish cooking. Okay, so there IS pepper and salt used in Swedish recipes. But that’s about all the spices good, traditional Swedish recipes have. They tend to be very bland by most other cuisine standards. How do I know this? Well, I worked in a local cafe for quite sometime as a teenager in a MN town called Mora. Mora is all things Swedish. 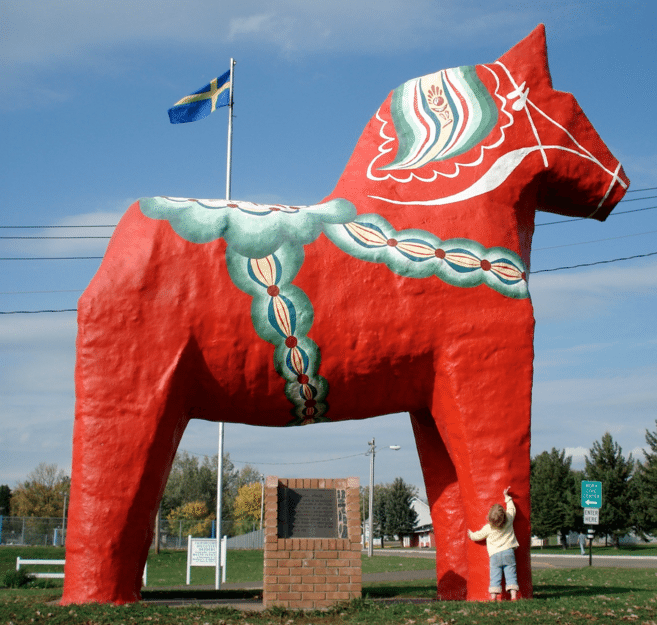 Mora is the home of a gigantic Dala horse, and a Mora clock commemorating the town’s Swedish roots. Mora’s sister city and namesake is Mora, Sweden. Mora DOES Swedish. And that little local cafe I worked at knew how to cater to its locals! Which meant it knew Swedish dishes inside and out. At that cafe, I learned how to make many a Swedish recipe. Yes, even lutefisk. Gah!! Try getting that smell out of your clothes! Note: traditional Swedish Meatballs require grated or minced onion, not chopped. My kids laugh at me when I’m sitting and grating onion. But, it’s totally worth it! AND…AND…Nate is 1/4 Swedish. I remember when we first married and I met his great-uncles Raymond and Russell. They were 100% Swedish, spoke Swedish, cooked Swedish, and one was dressed in overalls every time you saw him. And they were huge, tall men. Nate’s grandpa and these great uncles were children of Swedish immigrants. Quite a few years back Nate’s great-uncle was becoming too elderly to stay in his home by himself and wanted to clean out some of his belongings. I was utterly thrilled to be able to get one of the trunks that traveled with the family on the boat from Sweden. That, along with an original Swedish hymnal and Bible are treasures in our home. The stories and history those items have must be incredible! Note: soak your oats in milk for a few minutes to help give the oats more sticking power and soften them up. Nate’s parents stick to meat and potatoes, salt & pepper as the only spices, and lots of cream in their dishes. Standard Swedish cooking. I am often looking for the salt and pepper shakers when we are at their home for dinner. The Swedish roots are strong with those two :). 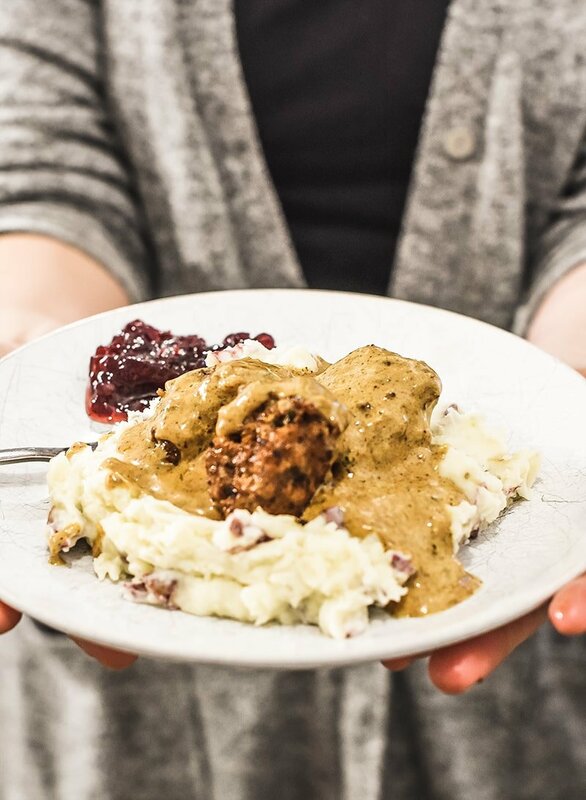 Swedish Meatballs have their roots as leftovers. No really, it’s true! The meat came from whatever scraps of meat and fat were leftover from the week, and then ground. Which is why Swedish Meatball recipes feature a blend of multiple meats. Onions were readily available because of the ease of storing them in the winter. Breadcrumbs were the leftover pieces of bread that had become stale or not used. And cream? Well, what is a Swede without good cream? Truly, Swedish Meatballs are the ultimate in leftover use! Why did they cook them in a pan, you wonder? Well, I’m thinking that they weren’t terribly concerned about perfect ball shapes for their leftovers. AND…ovens. Yeah, they weren’t quite as available, in that time, as a plain ol’ fire or cooktop. 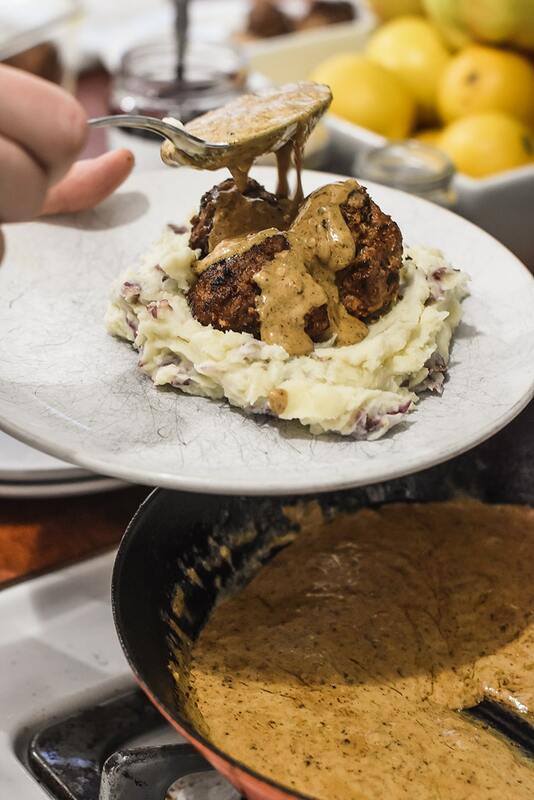 Traditionally, Swedish meatballs use the scrapings of the pan with a bit of cream and flour added to create the gravy that you pour on them. 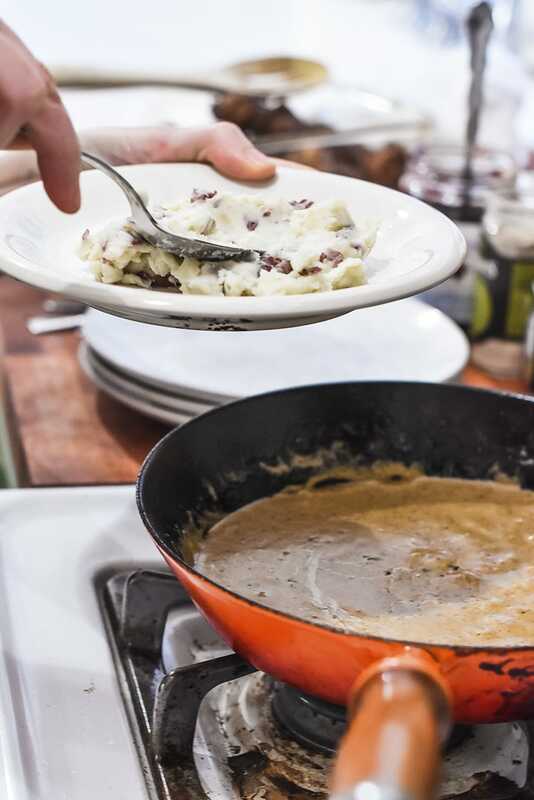 And, of course…serve with mashed potatoes and lingonberries. Chilling the meat mixture for about an hour will help the balls hold together while cooking. Traditional Swedish Meatballs are soft in texture, this is normal. Balls that are only 1 inch in size is traditional. Probably because of how quick they were to cook. Traditional Swedish Meatballs aren’t really balls. More like triangles. They are cooked on a side and then turned, resulting in more of a triangle shape. Perfect. Traditional Swedish Meatballs are rather bland, almost sweet (because of the nutmeg) in flavor. Feel free to adjust the recipe as you prefer. 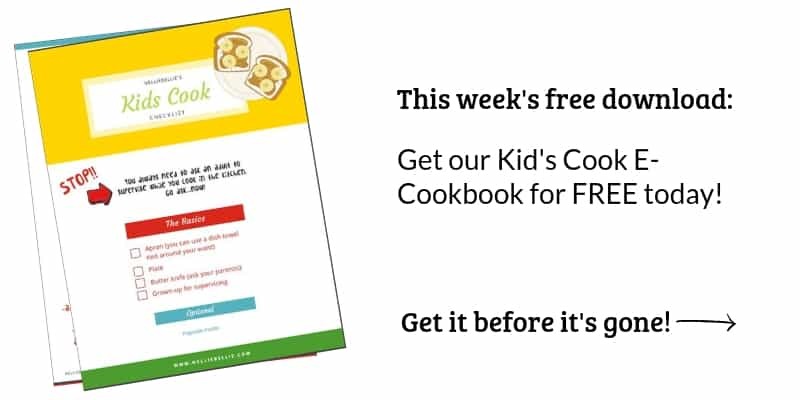 This is a larger recipe because…leftovers! I make this large batch and freeze about 1/2 for a later meal. Soooo good! Put the milk into a large bowl, add the oats, set aside. In a large skillet melt the butter and add the minced onion. Cook for about 3 minutes. Add the onion, meat, egg, salt, pepper, and nutmeg to the oats and milk. Mix everything together and then chill in the fridge for about an hour. In the same skillet as the onion, melt 4 tablespoons of butter on medium heat. 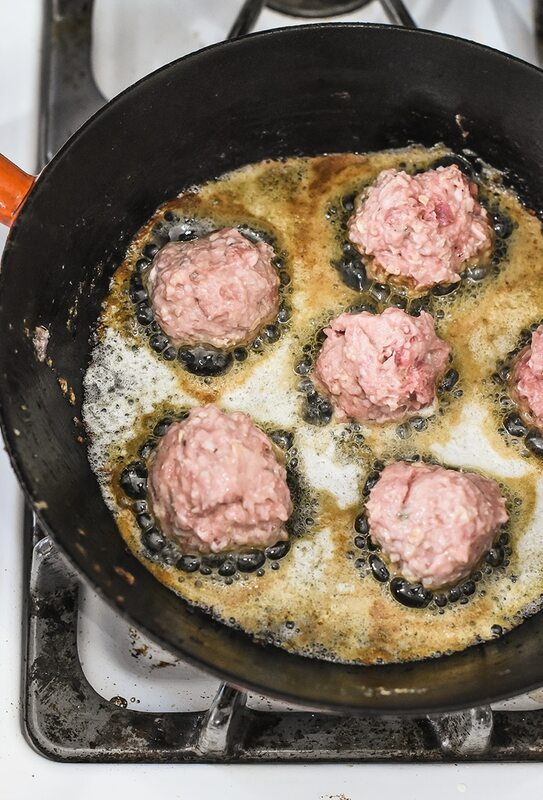 Using two spoons, form the meat mixture into 1 inch balls and place into the skillet. Leave room around each meatball. Cook on each side turning to the next side after about 2 minutes. 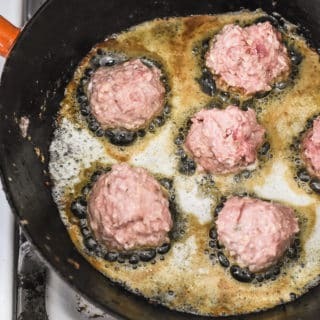 Set cooked meatballs into a pan in a low-heat oven while cooking the remaining. 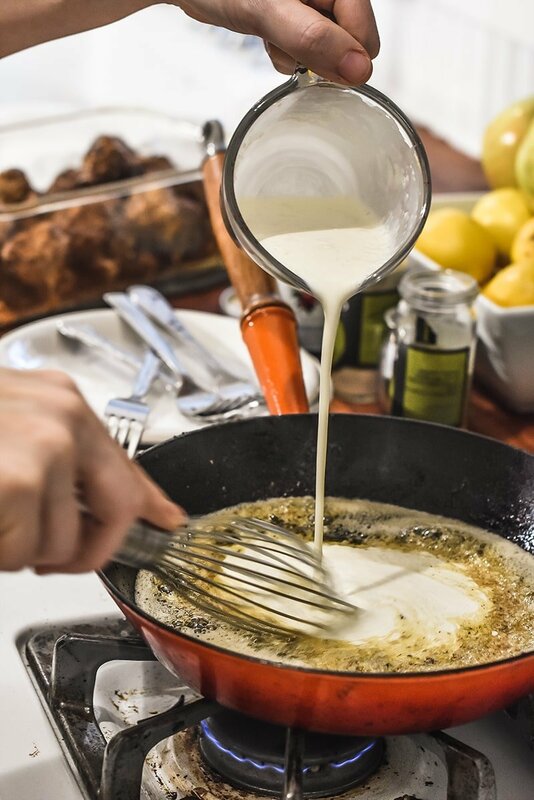 To make the gravy, mix 3/4 cup of cream with 1 tablespoon flour and slowly stir into the drippings of the pan. If desired, add beef broth for more liquid. Many recipes for traditional Swedish Meatballs call for white pepper. Try using white pepper in place of black. 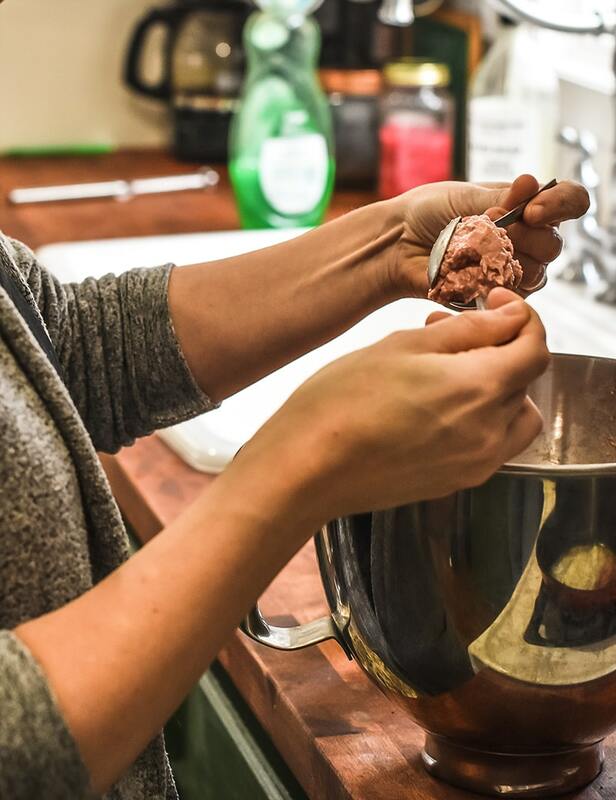 Use your hands for mixing the meat...don't over mix! I am first generation and spent most of my summer’s in Sweden. Everyone love’s my mom’s Swedish meatballs. Unfortunately, Lena is no longer with us, but the tradition of making them with my daughter continues on Christmas Eve when we have a smorgasbord with many family and friends. The only replacement my mom made was to include a can of French Onion soup and only beef. We never incorporated the Nutmeg, but I will try that soon. I was in Sweden 2.5 years ago and amazed at the wonderful restaurants and fresh produce in the market. Thanks for sharing. A can of French Onion soup would probably deepen that flavor and add some much needed flavor. A fantastic idea! I would love to know if your Lena’s recipe is similar. Just like chili and chocolate chip cookies, I find Swedish households have varying ways of making their meatballs. And, of course, their’s is the best ;). Love hearing about your summers in Sweden and am COMPLETELY jealous! Hi, or maybe I should say Hej ☺. Great post about Swedish meatballs. 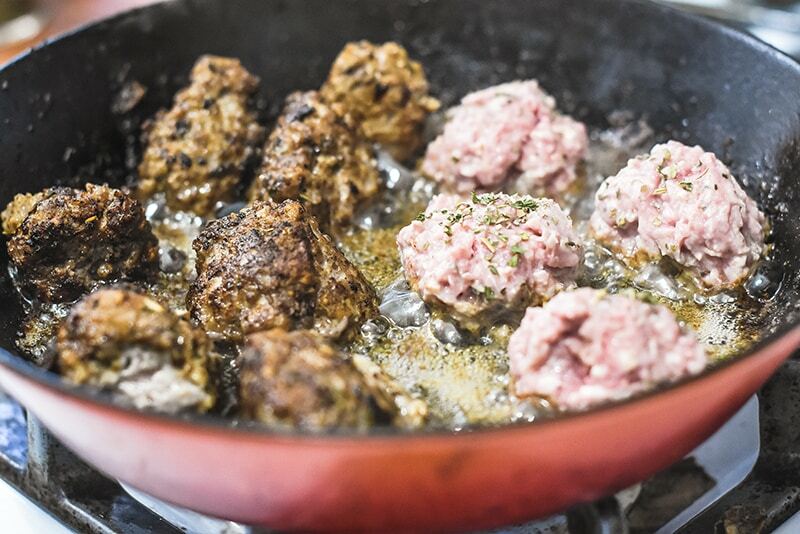 I’m Swedish myself (but I live in France) and its really interesting to see how the meatballs recipy has stayed the same for generations and not been changed at all, its exactly the same ingredients that I use for my meatballs, sometimes I use only ground beef and not pork but that’s only because I like the taste of ground beef better. Hej! Love the name Annica. Very Swedish :). 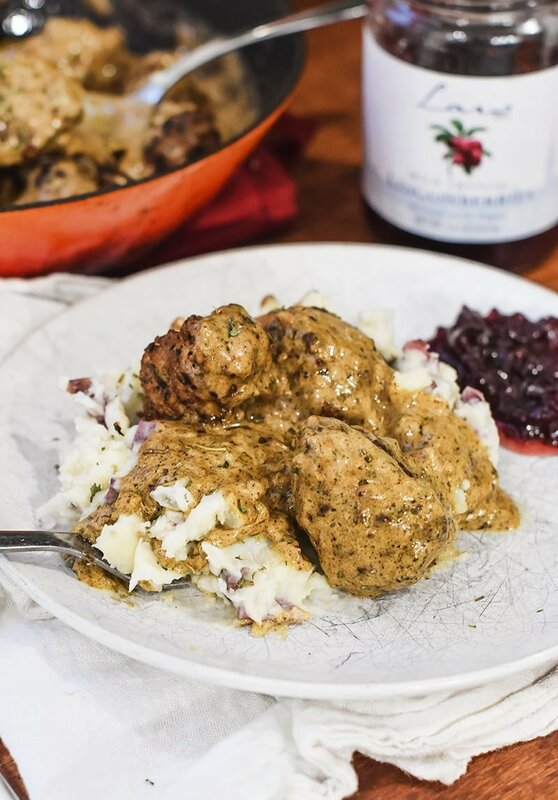 I adore recipes that stay true to their old time roots and the Swedish meatballs surely are one of those! I agree, I generally use ground beef in mine as well. My kids prefer it :). Tack tack!